promoted environmental best practices in managing our properties. and appreciate the value of doing so for future generations. of care and commitment to sustainability as our restoration projects. make a positive difference and help them succeed over the long-term. When it comes to being environmentally responsible, we put our money where our mouth is. That’s why we invested heavily in solar panels on our new-build commercial properties and use energy saving LED lighting wherever possible. We regularly harvest and repurpose rainwater, provide electric car charging stations in our parking garages and ensure oil drips from vehicles parked in our garages do not end up in the storm sewers. While initiatives such as these are not without cost, we recognize that there are long-term benefits that accrue in the form of reduced energy costs that are passed on to our tenant partners. 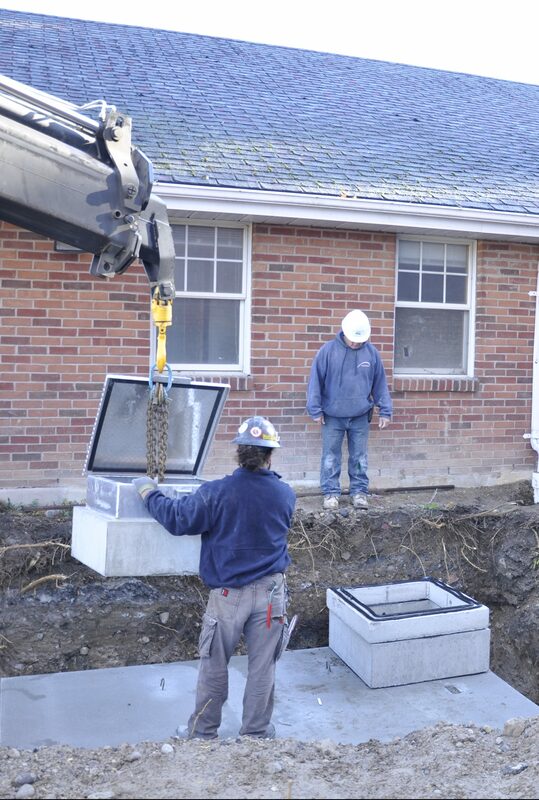 We utilize high efficiency building design, or ‘green building’, in all of our projects. Green building focuses on the inclusion of sustainable environmental solutions in design, construction and property management. It involves a number of energy efficient practices, many of which are described below. Modern solar panel technology harnesses the sun’s natural energy, converting it to electricity, which results in reduced environmental impact. Initial capital investments are offset over the long term by lower energy costs. Currently, Vesterra has a total of 49 properties with solar panels in use or under development. Geothermal energy is energy that’s naturally generated and stored in the Earth. This energy can be converted to highly efficient heating and cooling for residential and commercial properties, reducing the use of traditional energy sources. Currently, Vesterra has 5 properties with operational geothermal systems. LEDs (Light Emitting Diodes) are solid light bulbs, using only a fraction of the energy of regular light bulbs, while lasting up to ten times longer. New advancements in LED technology makes them a very viable choice for most lighting requirements. Vesterra has retrofitted the exterior and interior lighting on all its properties to LED lighting. In 2012, Vesterra began investigating the installation of a pilot green roof project. A green or ‘living’ roof is partially or completely covered with vegetation and a growth medium, planted over a waterproofing membrane. It may also include additional layers such as a root barrier and drainage and irrigation systems. 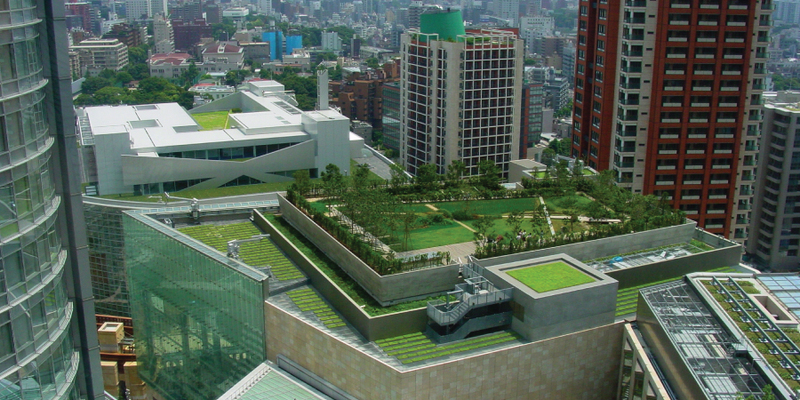 Green roofs absorb rainwater, provide insulation, and help to lower indoor heating and cooling costs. Electric vehicle charging stations supply energy for the recharging of electric or hybrid vehicles. A charging station draws energy from the power grid and recharges a vehicle while it is parked. All of Vesterra’s car charging stations are provided as a complementary service. Vesterra now offers free electric car charging stations at all of its developments. Rainwater harvesting reclaims rainwater that falls on the premises to repurpose for toilets or lawn irrigation. The rainwater is collected in a storage cistern on-site and used on an as-needed basis. Rainwater harvesting can greatly reduce a building’s water usage and decrease utility costs. In 2015, Vesterra was part of a study on rainwater harvesting for Waterloo Region – you can see the results here. Vesterra has installed rainwater harvesting systems at two of its properties and is planning to use these for all properties going forward. While a commitment to sustainability is only half the Vesterra story, the other half is unique in the annals of commercial leasing. Vesterra will help to meet its tenant partners’ changing needs, whether it is increasing the amount of space or reducing. Vesterra pledges to accommodate these changes with a minimum of disruption. Most commercial landlords balk at changes in a lease, especially if the change entails a reduction in the amount of space being leased. Vesterra understands the ebb and flow of business cycles and seeks to accommodate its tenant partners in any way we can. Our in-house interior design department is always ready and willing to help meet your needs as they change. As such, Vesterra is unique in the industry, as sustainability is more than a buzzword and viewing our tenants as business partners puts Vesterra into a category all of its own. Are you a commercial property owner interested selling your property, or in a buy-out and lease back program? This releases the equity in your investment, keeps you in your office, and ensures trouble-free property management that lets you focus on your business. Contact us to learn more.